I believe that people have a right to decide their own destiny; people own themselves. I also believe that, in a democracy, government exists because (and only as long as) individual citizens give it a "temporary license to exist" - in exchange for a promise that it will behave itself. In a democracy you own the government - it doesn't own you. Along with this comes a responsibility to ensure that individual actions, in the pursuit of a personal destiny, do not threaten the well-being of others while the "pursuit" is in progress." crazy - how could we have already reached the end of the alphabet! seems like we were on "a" was just the other day - here we are at z! z is for zap pa and zap ata! initially I had thought I'd do z is for zappa, then I didn't have a good snap, however, I do have a nice pic of a wall mural which features emiliano zapata (1879-1919). and if you really think about it zappa and zapata have a lot in common (I realized this when I really thought about zappa's words above) in their own zones of activity they were both revolutionaries and they both sure had lots of pizzazz! 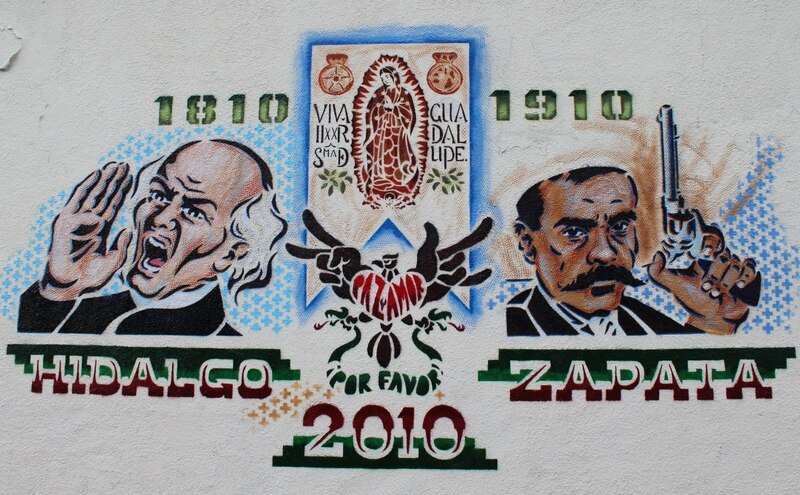 zapata left an amazing legacy; his influence lasts to this day, particularly in chiapas where the zapatistas are active. after our lady of guadeloupe, zapata is recognized as the next the most venerated national figure in mexico. the portal has a good entry on zapata if you're a bit lazy and want a quick read - it is bizarre how many z's in his bio - zapata was born to gabrial zapata and cleofas salazar of zacatepillo, the family were mestizos and at the time mexico was ruled by profirio diaz. in 1952 20th century fox released the film viva zapata! the screenplay was written by john steinbeck and was directed by elia kazan. guess who plays zapata - marlon brando! in addition to the kazan movie, the portal mentions a dazzling number of other characterizations of zapata in our zeitgeist. want to see something really zany? check out frank zappa on the steve allen show in 1962 when he was just 22 years old playing music on bicycles - crazy! Very nice way to end it! aha..showing this to my 19 year old kid in music school--he idolizes Zappa. Excellent finish! I can't believe it's already over! Kazan and Brando were a good team. I have thoroughly enjoyed your alphabet tour! thank you! no zzzzzz's here! Frank Zappa at 22!! Who knew?! are you doing NaBloBoMo? if so, there is a blog to sign up at; there should be a portal through my sidebar. Happy Happy! tony - i'd never forget!!!! were you always the last one on your class rolls? i often was since my last name begins with a y....and was always so happy when i was a kid when there'd be a kid in class whose last name began with a z!! tom - there is hope for the future with a 19 year old idolizing zappa!! angella - i love months i do the blogabet, the alphabet makes a lovely muse.